Strandline is a web serial and possibly a novel about the new subspecies Homo sapiens nictans. Why am I not sure if it’s a novel? Because I’m writing this sucker by the seat of my pants and looking to you for direction. It may end up as a novella or three, or a series of short stories. New episodes are posted every week or so. You can get updates by email or by RSS. Smartphone and ebook enthusiasts, check out the mirrors of Strandline on Feedbooks.com and Wattpad.com. 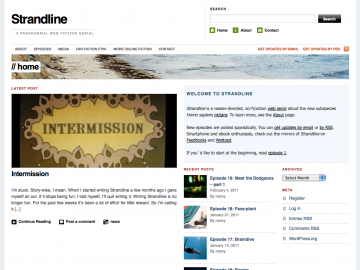 Strandline has not been reviewed yet. Strandline has not been recommended yet.